Regular readers will recognize this post from last year around this time. I’m bringing it back for new readers…and for those who wish they had bookmarked it last year! There are so many people with dietary restrictions these days, it can be mind-boggling to figure out who eats what. Vegans eat plants only. Nothing produced by animals (cheese, milk, cream, butter, eggs, honey) and of course no meat, fish, or poultry. Vegetarians eat plants plus food produced by animals (dairy products and eggs). No meat or poultry. Some eat fish, though most don’t. Gluten-free means eliminating wheat, rye, barley, and oats (unless the oats it is labeled gluten-free). This also translates into beverages made from these grains—think beer and rye whisky, for example. Someone who is celiac has a severe gut reaction to gluten and can be in agony from eating even a very small amount. Some people experience non-celiac gluten sensitivity, though this diagnosis is not yet accepted by mainstream doctors. People affected by gluten eat non-gluten grains—e.g. rice and quinoa. Grain-free means no grain of any kind—wheat, oats, barley, rye, rice, quinoa and corn being the main examples. The issue isn’t gluten, it’s carbohydrates and their effect on blood sugar. This is sometimes referred to as a low-carb diet. In practical terms, it means avoiding corn chips, crackers and breads, along with sweets, juices, and most alcoholic beverages (alcohol acts like sugar in the body). Paleo is a broad category describing what is sometimes called ancestral eating. The idea is to mimic the dietary proportions and unprocessed nature of food that was eaten by our long-ago ancestors. There is considerable variation, but these are a few of the common practices: No grains or refined sugar. Moderate amounts of animal protein. Plenty of healthy fats. Emphasis on real food rather than processed. Lots of vegetables. Allergies and sensitivities mean the person’s body over-reacts when a particular food or food category is eaten. Common allergies are dairy, nuts, peanuts, wheat and shellfish. Mild allergic reactions are uncomfortable to varying degrees. But allergies can be life-threatening if a person goes into anaphylactic shock. A lot of children have this sort of reaction to peanuts these days, which is why peanut products are not allowed in schools any more. Think: Does this need to be a sit-down meal? It’s much easier to accommodate variations if you have an open house with a buffet of snacky foods and beverages. Some suggestions and good recipes follow. But buffets don’t always work and you might find yourself organizing a sit-down dinner despite the complications. The host can ask. Sometimes guests don’t mention their food preferences because they mistakenly think they’ll sound rude. As the host, ask directly when issuing the invitation. “Anyone have allergies or preferences I should know about?” This opens the door for the guest to say something, and avoids any awkward surprises at the event. Serve good food that you can present to anyone without explanation or apology. Gone are the 1960s when the granola crowd served some concoctions that were just plain weird. I admit to making some of them myself! But today there’s an abundance of very good recipes for real food, and I’ve included links to several of my favourites. Put out foods in their whole form as much as possible. This makes it easy for people with sensitivities to choose what works for them without having to find you and ask what’s in everything. In this spirit, you might decide to put cheese on a board rather than incorporating it into several dishes. Alert guests to ingredients they might not expect to find. For example, almond flour is not a usual ingredient in crackers. So someone with a nut allergy could inadvertently eat them and have a reaction. 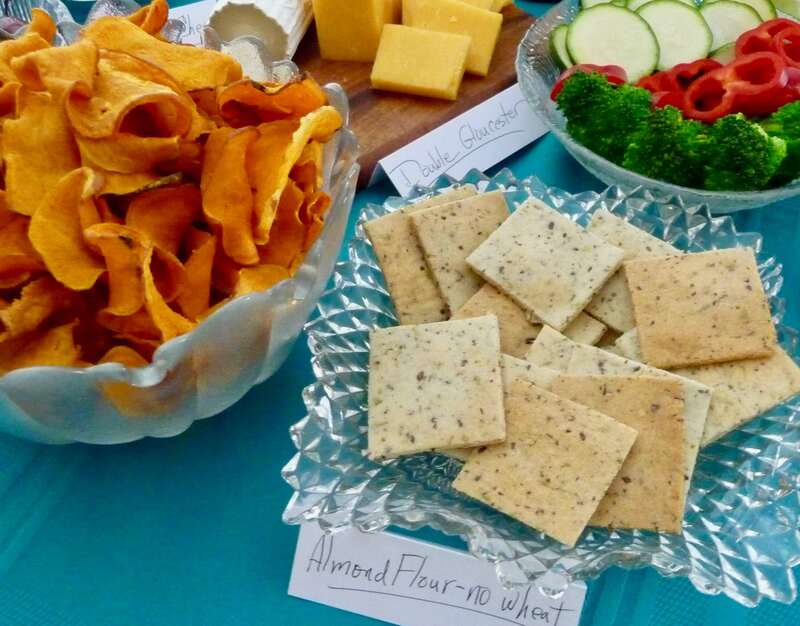 From another perspective, a wheat-sensitive person might pass by the Rosemary Crackers (below) without realizing they are grain-free and perfectly suitable. A simple strategy is to make small tent cards. Those in the photos were easily made by folding business cards in half. Go here for specifics—scroll down the page for more ideas and recipes. This entry was posted in Information, Action & Being Resourceful, Useful Resources, All Posts—newest first and tagged vegan, vegetarian, paleo, grain-free, allergies, gluten-free, special diets, holiday parties, holiday hospitality by Laurana Rayne. Bookmark the permalink.